The installation took place before more than 2,000 people at Newark’s towering Cathedral Basilica of the Sacred Heart. Cardinal Tobin concelebrated the Mass with six other cardinals and more than 60 archbishops and bishops. Five hundred priests and deacons also participated. The nuncio read the apostolic mandate from Pope Francis to the College of Consultors to authorize Cardinal Tobin as the new archbishop of Newark. 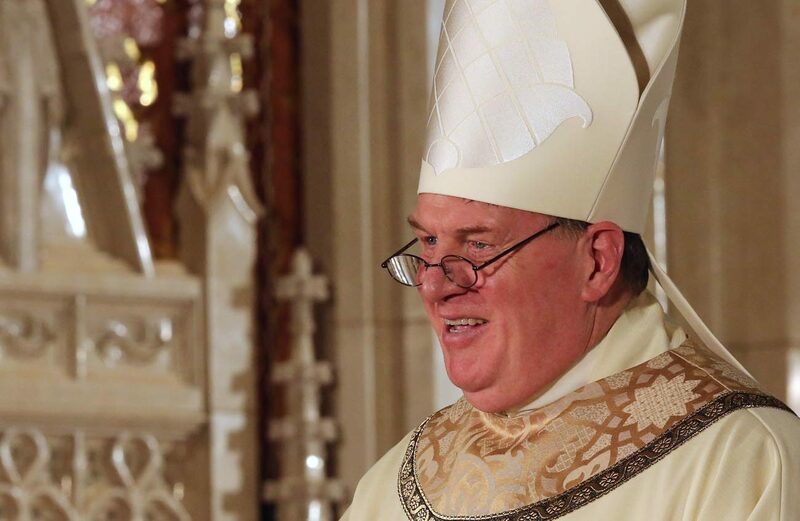 The letter noted that Cardinal Tobin carried out his episcopal responsibility to his flock in Indianapolis for four years “with prudence, decision-making and much learning.” It also commended him to the protection of St. Patrick and St. Elizabeth, patrons of the archdiocese. Carrying the unfurled scroll with the mandate raised high in front of him, Cardinal Tobin walked down the main aisle and was greeted with sustained applause. The cathedral was filled to capacity with the cardinal’s family and well-wishers from Newark and Indianapolis. New Jersey Gov. Chris Christie and his wife, Mary Pat, as well as Sen. Robert Menendez were among the civic representatives. The installation took place on the feast of the Epiphany and the choice of music reflected the liturgical season, as well as the special occasion. “O Come, All Ye Faithful” was the opening hymn. “Angels We Have Heard on High” was sung as the cardinal accepted greetings from representatives of clergy, religious, and laity of the archdiocese, ecumenical and interreligious groups and civil authorities. The responsorial psalm was a version of Psalm 98 commissioned for the occasion from Pedro Rubalcava. “Beautiful Star of Bethlehem,” “Joy to the World,” “The First Noel,” and “Hark the Herald Angels Sing” rang out in the church decorated with red poinsettias and evergreen wreaths. Ethnic diversity in the archdiocese was represented by prayers of intercession in Spanish, English, Korean, Polish, Creole, Ibo, Portuguese, Tagalog and Italian. At the end of Mass, Cardinal Tobin thanked “all those families to which I belong, beginning with the one that’s put up with me for 64 years,” specifically his mother, 12 brothers and sisters, in-laws, nieces, nephews, cousins, aunts and uncles who were present. He said his family taught him how to love and share while growing up in a one-bathroom house with eight sisters. The cardinal extended thanks to his Redemptorist family and “bishops in episcopal service in Indiana and New Jersey.” When he thanked Archbishop Meyers for his welcome and “the care you’ve given to this archdiocese for 15 years,” the congregation offered sustained applause. Of his newest family in Newark, Cardinal Tobin said, “These past couple of months have been an interesting roller coaster of emotions, a time of preparation, anticipation and change for all of us.” He expressed “heartfelt, sincere thanks” to the “army of people” who worked since his appointment was announced Nov. 7 to plan multiple services and celebratory events. PREVIOUS: How will U.S. policy affect Middle East’s Christians in 2017?